I just love smuggling vegetables into baking (remember the Chocolate Zucchini Cake?) 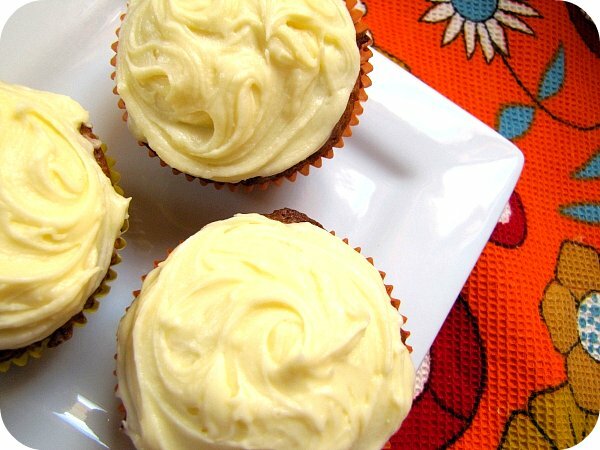 and when they are quick and easy to make and have the added bonus of cream cheese icing... mmmmmmmmmm!! I found this delicious recipe here, and modified it slightly to fit with what I had in my cupboard (as I am sure you all do). Don't have pumpkin pie spice? Try using cinnamon and nutmeg instead. Don't have plain yogurt? Measure out the amount needed with milk and add a teaspoon of white vinegar, stir and leave to rest for a few minutes. You then have your very own buttermilk that I say passes just fine as runny yogurt! These are great eaten without icing, or you can dust with icing sugar or make my favourite... cream cheese icing! Line 12 cups (each 2 1/2 inches wide) of a standard muffin tin with paper liners; set aside. In a large bowl, stir together flour, sugar, pumpkin-pie spice, baking powder, baking soda, and salt; set aside. In a separate bowl, whisk together yogurt, butter, and egg. Make a well in the center of the dry ingredients and add yogurt mixture. Stir until just combined. Fold in carrots. Spoon batter into prepared muffin cups. 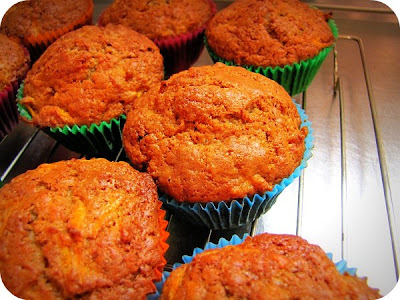 (If desired, muffins can be baked immediately in a 375-degree oven for about 20 minutes.) Freeze until firm, about 30 minutes, then cover tin with plastic wrap, and freeze until ready to bake, up to 3 months. Preheat oven to 375 degrees. Bake muffins (still frozen) until a toothpick inserted in center of one comes out clean, about 30 minutes. Transfer to a rack. Serve warm or at room temperature. Oh my delicious! Right, Im off to buy some cream cheese! mmmmm - they look delicious! How do you get your cream cheese icing so creamy looking? I sift the icing sugar and use an electric beater but it's STILL lumpy! Do you sit your cream cheese out to soften/use that soft cream cheese? yum and that icing looks so good!!! they sound fab! Problem is that hubby can smell a veggie in a cupcake a mile off! I can just about fool the kids but he has RADAR I tell you! Yummy PJ! The veggies do seem to cancel the calories don't they? Yum! Can't wait to make these!